I finally received my first halo nail polish from http://www.shop.llarowe.com/main.sc they have a great selection of colors but the only problem is that more often than not the polishes that I like are out of stock, but if you catch them while they are in stock they get them to you quickly. I ordered mine last saturday and I received it on Tuesday. I was so excited when I finally got my very own halo polish. It looked like it would take way too many layers to get full coverage so I layered it over one coat of a silver nail polish that came in a gift pack I purchased from Urban Outfitters last christmas. 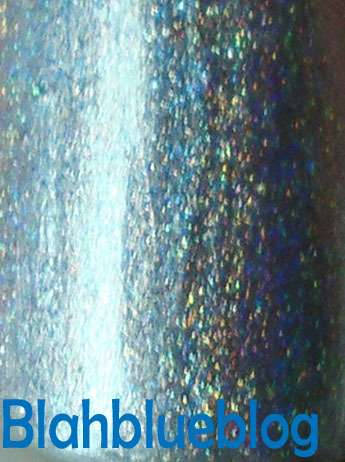 I only used two layers of the Glitter Gal Holographic Polish and it seemed to be amazing. It looks like normal silver polish in certain light, but if you go outside it is super glittery and noticeable. When I went to take a few photos it was impossible to get a good photo, maybe it is just my camera because when I purchased it there were photos on the website….